Officers undergoing instruction at the Police Training School now have an upgraded and more realistic mock report room to hone their skills. Planning and Development Branch Chief Superintendent David Thomas handed the room over to PTS Deputy Commandant Peter Morgan in an official ceremony on December 13. The facility features all the wares of report rooms being upgraded Force-wide under the Station Improvement Project, including a few newly improved items. P&D officers started work designing and building the new room, revamped out of the School's old mock report facility, in September. Project Manager P&D Superintendent Graham Lander said it not only brought the training facility up to Project standards, it also allowed for the easy trial of new designs and equipment for report rooms before implementation. "With the upgrades to report rooms across the Force, we felt it was appropriate PTS be given a mock facility of the same standard for training," he said. "We refurbished the old room at PTS and brought it up to Project standards. So, now it not only facilitates officers' training needs, it also serves as an ideal test bed for new design ideas." 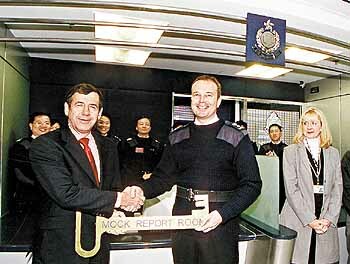 Mr Lander said new designs trialled during the refurbishment have proven good enough to implement in report rooms across the Force, such as non-glare lighting and a new monitor position, sunk into the counter. "We are now going to incorporate these improvements into the Project and we will continue to use the mock room to try new designs and materials," he said.